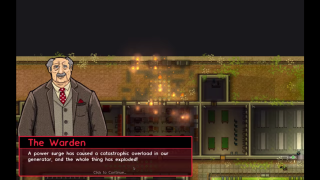 Alpha 36 represents the end of three years of Prison Architect's alpha. As we found out last month, Prison Architect V1 will be available in October, and while the game will continue to receive updates they'll no longer be alpha updates, which means an end to these alpha update videos (with the exception of a special live V1 launch video planned for EGX in late September). This final alpha update includes the new "random event system", which the developers describe as like the random events in SimCity but not as "stupid". Examples include fire. Rather than have individual cookers set to catch fire once per set period of time, which in a big prison would lead to almost constant fires, the random event system sits apart from the rest of the simulation and just decides every now and then to create a fire, for example in a kitchen or power station. As with gangs, which were introduced in another recent update, the random event system is optional. It's designed to make things more challenging, and so is set up to only induce events when you're doing relatively well. Players will need to keep possible events in mind and do things like install sprinklers, keep their power stations running relatively low, etc. Check out the 35-minute update video if you want to find out more about the kind of random events you can expect, like the viruses that make people look like zombies.